With the advent of the modern automobile, spending the weekend with our canine best friends has become so much easier. Creating memories with our families together with our 4-legged furry friends has become all the more meaningful. However, just as we have to ensure the safety of our human passengers, it is also crucial to guarantee the safety of these four-legged creatures we now consider as important members of our modern family. 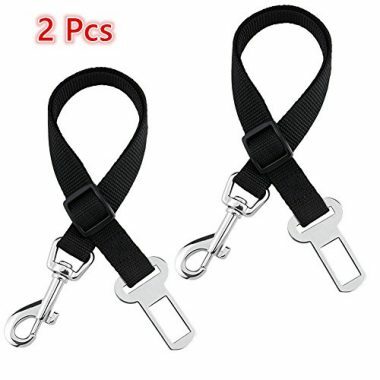 A sturdy, easy to use, and highly durable dog car seat belt can, thus come in handy. Like the human version, a dog safety belt helps ensure safer travel for our pooches. Additionally, this also helps minimize distracted driving activities involving our pets. It is not uncommon that, in their excitement of an expected fun times with your family pooches will jump onto the front passenger seat, paw or lick your face, or even entice you to play with it or give it its favorite treat. If you allow this to continue, this will increase the risk of vehicular accidents. A dog seat belt will ensure car safety until you arrive at your intended destination. Then, you can play all you want. As such, choosing the best dog seat belts to keep your canine safe and your family while traveling becomes all the more important. And for that, we’ve got you covered. Vastar currently enjoys the trust of many dog owners today because of its rather simple yet effective design coupled with 6 colorful designs to choose from and a good price to boot. 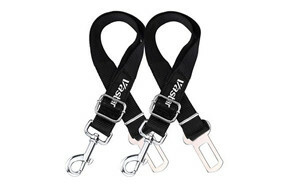 The Vastar car restraints for dogs come with heavy-duty hardware to help secure your pooch while on the move including zinc allow clips that swivel 360 degrees for optimum movement for your dog. Unfortunately, you will have to find a suitable body harness to go with the Vastar to make the whole system complete. 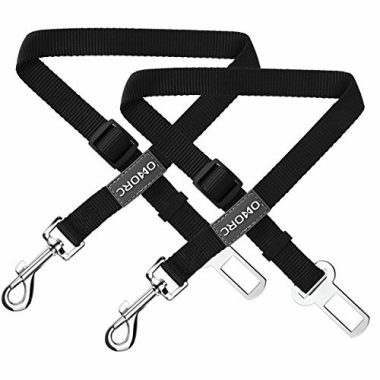 This dog car seat belt from OMorc is somewhat similar to the Vastar in design albeit at a slightly lower price, thanks to an ongoing discount. The strap is made of extra-wide durable nylon fabric complete with zinc allow swivel clip. Technically, the only difference is the logo of Omorc plus the fact that it only comes in black. You’d have to buy a separate body harness, too. At least, you’d be able to choose a better looking harness to complement the black design of the OMorc. It may be priced higher than the rest, but considering PAWABOO is already a combination of a dog harness for car and seat belt, it turns out to be an even better deal. The PAWABOO includes a super comfy, fully padded harness that is designed to be extra wide to allow for the more efficient distribution of impact forces and help minimize injuries to your pet’s internal organs. The closures are designed for easy-on, easy-off applications while the 100% Oxford polyester fabric construction gives it exceptional comfort for your pooch. It comes in 10 color designs, too. 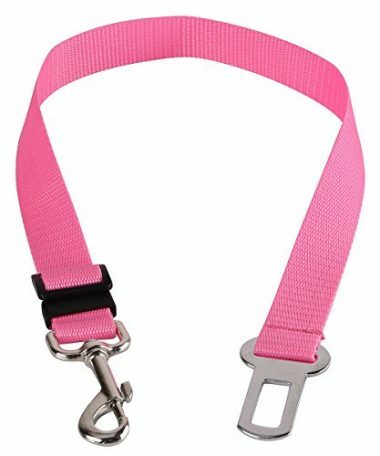 Featuring the same technical specifications of the Vastar and the OMorc, this dog safety belt from Friends Forever offers an alternative to those who may not like zinc alloy in their hardware. The Friends Forever comes with a swivel clip that is made of industrial steel, making it exceptionally sturdy and super strong. The strap can be easily adjusted as well. With the logo of Cosmoplus emblazoned on the strap of these 2-pack seat belts for dogs, there’s no mistaking where it came from. Unfortunately, we find its design to be similar to the others in this list, making it quite a very generic item to begin with. From the materials used for its strap and hardware, almost everything is the same. Perhaps what you will find appealing in the Cosmoplus is its price. Compared to similar products in this list, this one comes at an even lower price even without discounts. They’re adorable and do not have large prints like those of the logo of the manufacturer. That’s SPHTOEO dog car seat bet to you. With quick-release buckles, nylon constructed fully adjustable strap, and 6 colorful designs, the SPHTOEO offers a more affordable and definitely simpler yet equally effective way of securing your pet on the go. 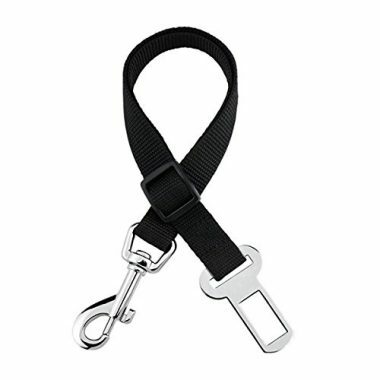 The Fypo car restraints for dogs typify modern-day vehicle safety systems for dogs. The tab easily fits into most car seat belt buckles and comes with fully adjustable strap for better fit. It’s durable enough to hold a pooch that weighs up to 50 pounds. The only downside we see is that it is slightly pricier than products of the same design and features. If you like the PAWABOO but would like a different brand, the Way-Seven should be a good choice. 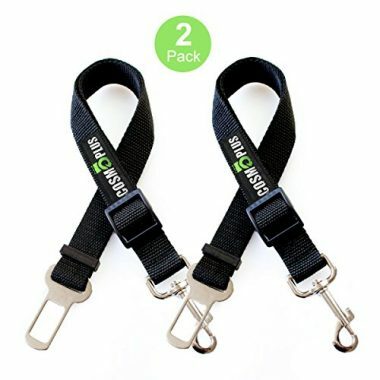 This seat belt harness for dogs is priced slightly lower than PAWABOO yet has the same specifications such as air mesh padded vest, fully adjustable straps, and a harness that’s made of 100% Oxford polyester. The one thing that usually limits the Way-Seven’s popularity is its limited number of design choices. But if you can save 50 cents off your purchase, then its limitations will be mute. The aHeemo dog car seat belt is just like any other dog safety belt. The only difference is that the aHeemo is so unpretentious it only comes in black complete with zinc alloy wswivel clip and metal clasp. The strap is made of nylon fabric and is fully adjustable. 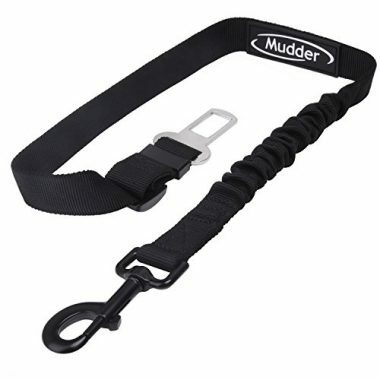 At first glance the Mudder looks like any other dog car seat belt. However, the strap comes in two sections. One is a non-elastic segment made of premium quality nylon fabric. In another section, a bungee buffer made of elastic nylon helps protect your pooch against shock attenuation which typically occurs in car crashes. Swivel clip, quick-on and –off clasp, and a quick-release carabiner clip complete the Mudder’s design. The swivel clip is made of nickel alloy instead of the usual zinc alloy construction. Picking the right dog seat belt should be fairly easy, yet a lot of folks actually pick the wrong ones. Many pick just about any other harness that they can get their hands into since they practically look the same; well, almost. The thing is that there are a lot of things that you have to consider when buying products such as these. First and foremost will be the issue of whether it really is safer to put your pooch on a car seat harness than putting it inside a pet carrier or portable travel crate instead. This is just one of the several issues that we will try to answer in this comprehensive buyer’s guide we have prepared for you. Are Seat Belts for Dogs Safe? There really is a big question as to the safety of these products. There have been reports of incidents where the dog was severely injured after a car crash even though it was wearing a doggie seat belt. Let us try to examine what a doggie seat belt looks like because its safety is directly related to its design. A dog seat belt is pretty much the same like your car’s seatbelt except that one end connects to your pet’s harness and the other one is equipped with a metal clasp that fits into the buckle of your car seatbelt. Some designs call for sliding your car’s seatbelt through the doggie safety seatbelt. The length of the tether is shorter than that of a leash to help keep your pooch stable and in place while the car is moving. The problem is that, in a car crash, the tether will stop the forward momentum of your dog’s body. If its body harness is not fully padded, there is a chance that the sudden acceleration-deceleration can result to internal injuries. Let us try to compare this with two other dog safety systems that are employed in vehicles: secure gate and dog crate. A secure gate is typically used in wagons and SUVs, providing a barrier between the rear compartment of the vehicle and its passenger cabin. Dogs have the entire space of the rear compartment to themselves. They are not tied down since they are already somewhat in a ‘cage’. Unfortunately, in the event of a car crash, the sudden increase in momentum can hurl the dog all the way to the front of the vehicle and smack right into the secure gate. This can lead to injuries as well. Even in sudden stops without causing vehicular crash, the dog can still be flung from its feet and against the bars of the gate. On the other hand, a dog crate essentially reduces the space upon which dogs will be able to move. Most travel crates today are made of hard plastic which is a lot better than metal cages. The main issue is that, if the crate is not tied down or secured on the vehicle, it can get thrown in any direction in the event of a car crash. What’s worse is that the dog can sustain injuries from hitting the inside walls of the crate. At the very least, since the space is relatively smaller, the injuries should be lesser in severity and extent compared to those injuries found in secure gates. Even if the crate is tied down, the dog can still hit the insides of the crate in the event of sudden deceleration. So, among these three methods of securing a dog while traveling, the use of a car seat belt for dogs remains the safest since it secures your pooch in its place and provides greater stability for your pet while the vehicle is moving. Do take note that in all three doggie vehicle safety systems, the risk of injury is ever-present in the event of a crash or an accident. How Do You Use a Dog Seat Belt? Depending on the type of dog seat belt that you purchase, using these vehicle safety contraptions for dogs is quite easy. However, it should be understood that under no circumstance should you connect such systems to a doggie collar. It should only be attached to a padded body harness for dogs. A dog seat belt is more like a very short leash that you attach or connect to your car’s existing car seat. If it comes with a clasp, make sure that its size fits the buckle of your car seat belt. You will have to secure the clasp onto the buckle first. Most tethers are fully adjustable. You may want to lengthen the tether first before connecting the clip to your pooch’s harness. Then, readjust the tether to the desired length. If the dog seat belt didn’t come with a clasp that can be buckled, it usually comes with a loop which you need to insert your car’s seat belt including the shoulder strap through. You will then buckle your car’s seat belt like you normally would. Now, adjust the length of the tether accordingly. Before you start looking for the best possible seat belt or harness for your pooch, let us first try to understand the legal basis for using such kinds of restraints. Technically there are no laws requiring motorists or drivers to secure their dogs with harnesses or seatbelts whenever they are traveling on a motor vehicle. However, there are many states in the country that do implement distracted driving laws. Many of these legislations prohibit driving with a pet on the driver’s lap. Doing so, and if you do get caught, can automatically penalize you with a relatively small fine, but a fine nonetheless. And if you happen to be driving in New Jersey with your pooch on your lap, don’t be shocked to be penalized up to $1,000 for doing so. Even if your pooch was not on your lap, the mere fact that you are traveling with an unrestrained dog means you’re guilty of violating the law on distracted driving. Other states may have different laws that apply to various situations. For instance, if you’re driving a truck in California, Connecticut, Massachusetts, Minnesota, New Hampshire, Oregon, and Rhode Island you’re actually expected to put your dog in a crate which is then placed on the flatbed of your truck. The crate is also supposed to be secured properly or cross tied to allow for greater security. It is, thus crucial to be fully cognizant of the distracted driving laws in your state so you can be guided accordingly on what kind of dog seat belt you have to purchase. That being said, let us now look at the things you may want to focus on when buying a dog seat belt. 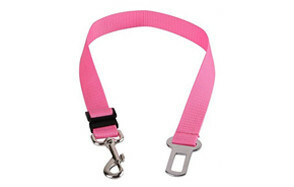 This is perhaps the single most important factor that you have to look for in a dog safety belt. 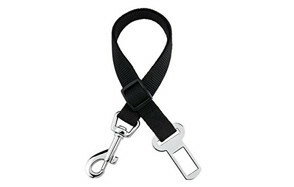 There are a lot of products in the market that are nothing more than a short-length leash with a clip on one end which you use to attach to your dog’s harness and a metal buckle on the other end that fits into the slot of your car seatbelt buckle. It is very easy to make a contraption like this. Virtually anyone who understands the basic elements of the design can make it. You can even make one yourself if you want to. However, only those manufacturers that put their products to rigorous testing deserve your attention. Many of the products available today will only keep your dog from interfering with your driving. In no way do these help save your dog in the event of a car crash. Do take note that the dog car seat belt may survive the impact, but not necessarily your dog. As such, it is imperative that you read the fine print of these products to make sure that they are both crash tested AND safety rated. This should make you feel good about your choice. The construction of the safety harness matters. High quality materials don’t always guarantee an excellent product, unfortunately. You will also have to take note of how these materials are used or fused together in the design. The stitching of the harness or safety belt should give you peace of mind about its durability and strength. The idea of securing your pooch while traveling is so that you can easily bring your dog anywhere. 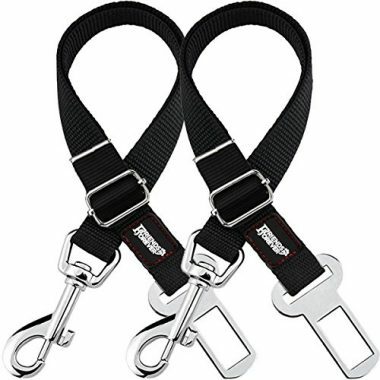 This means that the doggie safety harness should also allow for it to be used as a walking harness. It would simply be a waste of effort and time if you have a different harness for the car and for walking or strolling. While this is actually possible, it stresses your dog and puts undue pressure on you, too. Remember, once you reach your destination, your pooch will already be raring to go. Imagine the frustration when you still have to remove your dog from its car harness and put it into its walking harness. 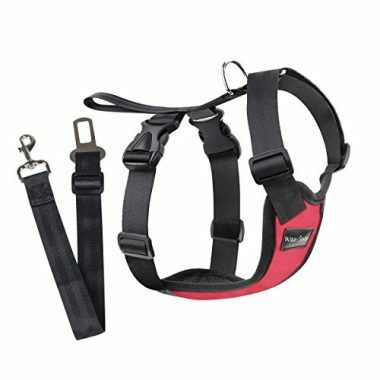 This actually goes hand-in-hand with the versatility of the car safety harness as a walking harness. If you can attach a raincoat or even an outer garment onto the harness, then it would really be amazing. Since we’re essentially talking about putting the seat belt harness for dogs on your pooch every time you take it for a drive you might also want to make sure that it is rather easy to put on. 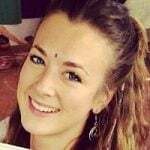 But, if you don’t mind complicating its application, then by all means, you can disregard this parameter altogether. Most dogs are not really comfortable with the use of dog seat belts since this restricts their freedom of movement. However, like all doggie contraptions, it takes training and lots of patience to get your dog used to a seat belt. If your pooch is already trained to walk on a leash using a body harness, the process of learning should be a lot faster. The key, however, is to first introduce the idea of the seat belt to your pooch. 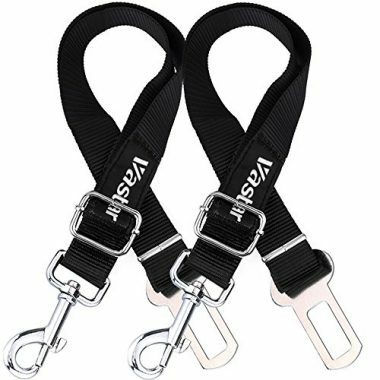 Again, this is to make sure your pooch will learn to accept the safety harness as normal every time it gets onto your vehicle. You may want to put your pooch inside your car with the dog safety harness securely attached to your car’s seat belt. You don’t have to connect this to your dog yet and you don’t even have to drive your car. Just spend several minutes every day with your dog inside your car and the seat belt just lying on the car seat. This helps teach acceptance of the seat belt to your dog. 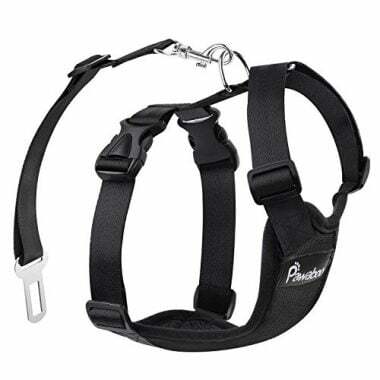 Once your pooch is no longer paying too much attention to this safety contraption, you can start attaching it to your pooch’s harness. Do so without running your car. This is just to acquaint your dog to the feel of the harness on its body tied down to your car seat belt. By the time your pooch is already relaxed and has grown accustomed to being ‘tied’ down into the seat belt, you can start your car’s engine. Slowly but surely, you’ll next take your pooch for a short drive around your neighborhood. Go slow so that your dog will not injure itself by squirming against the safety harness. Take your cue from your pooch. If it can already hold its place in your car with the safety harness on, then you can increase your speed and distance of your trial runs. It shouldn’t take long before your dog will already understand that it needs to wear its seatbelt every time your dog jumps into your car and you take it for a spin. Traveling with your canine best friend can be lots of fun. However, if not fully prepared for it, traveling can be a surrealistic nightmare. Here are some travel tips to make sure your trips with your dog are hassle-free. Make sure to keep your pooch in tip-top shape. Traveling can put a lot of stress on your pooch. This can be amplified further if your pet is simply not in excellent physical health. Use the appropriate vehicle safety and carriage system for dogs. You have three choices: secure gates, portable crates, and dog car seat belts with the appropriate harness. Always choose a crash-tested product. Don’t forget to bring appropriate documentation for your pooch including its identification papers, vaccination records, and medical or veterinary records. You might want to consider having your pet microchipped. If traveling by car, make sure not to feed your dog before you leave. This helps avoid motion or car sickness. Additionally, you may want to give it access to plenty of water while on the road. Also plan for scheduled stops to give your pooch the opportunity to relieve itself and stretch. If traveling in an airplane, make sure you understand airline requirements on bringing your pet along. Airlines will require your pooch to be carried in appropriate crates. So, make sure you check these guidelines first. If you’re going to stay in a hotel or another accommodation, make sure to find out in advance their policies regarding pets. Some accommodations do allow guests to bring their pets with them. If your pet is allowed to stay, make sure you understand the etiquettes related to having a pet in a hotel or similar types of accommodation. Seat belts for dogs help provide for a more stable platform for your pooch to enjoy traveling with you. While these systems cannot prevent injuries from car crashes, these can nevertheless help minimize the severity and extent of such injuries.